16 GB internal memory and 32 GB memory card free with it. Double Sim & separate SD Card slot. Run heavy games and app smoothly. Install big apps games in just seconds. Sim 1 is 4g but Sim 2 is 3g/2g. High charging time. No quick charge option. 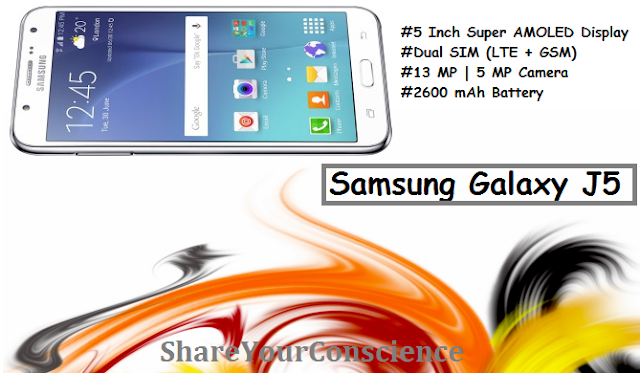 Samsung Galaxy On5 from Samsung is a Quad-core 1.3 GHz Cortex-A7 powered smartphone running over a 5.0 inches screen. This handset was launched in India on 2015, October. Samsung Galaxy On5 will be available in India for Rs 8,990. Its a Dual SIM (Micro-SIM, dual stand-by) handset sporting a 5.0 inches screen with 720 x 1280 pixels resolution Handset weight 149 g with Li-Ion 2600 mAh battery. Samsung Galaxy On5 is using the chipset Exynos 3475. It is running with HSPA, LTE speed. There is 8 MP, 3264 x 2448 pixels, autofocus, LED flash front camera and 5 MP rear camera . Its memory configuration is as : internal memory-8 GB, 1.5 GB RAM. It has OS ,and comes up with a dimension of 142.3 x 72.1 x 8.5 mm (5.60 x 2.84 x 0.33 in). When we talk about features. It supports microSD, up to 128 GB. GPU : Mali-T720. Display Type: TFT capacitive touchscreen, 16M colors. Video: 1080p@30fps. Other feature:Geo-tagging, touch focus, face detection. 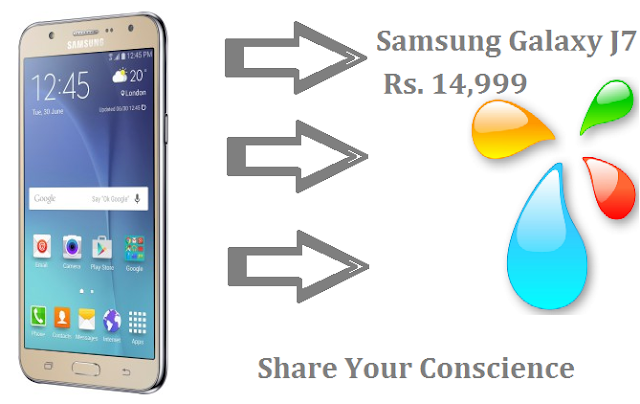 Samsung Galaxy J7: 14,999 Rs. Samsung Galaxy J7 from Samsung is a Quad-core 1.4 GHz Cortex-A53 & quad-core 1.0 GHz Cortex-A53 powered smartphone running over a 5.5 inches screen. This handset was launched in India on 2015, June. Samsung Galaxy J7 will be available in India for Rs 14,999. It's a Optional Dual SIM handset sporting a 5.5 inches screen with 720 x 1280 pixels resolution Handset weight 171 g (6.03 oz) with Li-Ion 3000 mAh battery. Inside the hood Samsung Galaxy J7 is using the chipset Qualcomm MSM8939 Snapdragon 615. It is running with HSPA 21.1/5.76 Mbps speed. There is 13 MP, 4128 x 3096 pixels, autofocus, LED flash, check quality front camera and 5 MP, LED flash rear camera . Its memory configuration is as : internal memory-16 GB, 1.5 GB RAM. It has ,and comes up with a dimension of 152.2 x 78.7 x 7.5 mm (5.99 x 3.10 x 0.30 in). When we talk about features. It supports microSD, up to 128 GB. GPU : Adreno 405. Display Type:Super AMOLED capacitive touchscreen, 16M colors. Video: 1080p@30fps, check quality. Other feature:Geo-tagging, touch focus, face detection, panorama. When we talk about Gadgets, Samsung is the most trusted and popular brand. 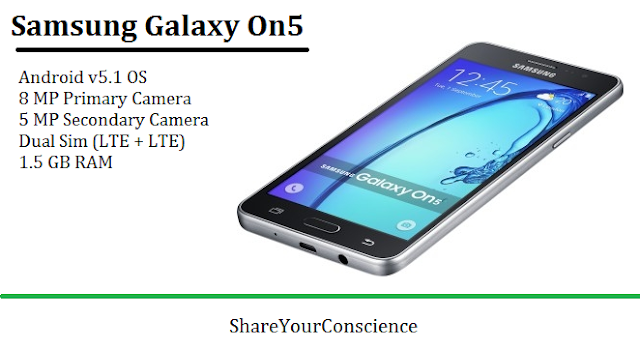 Samsung Galaxy J5 a Samsung product is a Quad-core 1.2 GHz Cortex-A53 powered smartphone running over a 5.0 inches screen. This handset was launched in India on 2015, June. Samsung Galaxy J5 will be available in India for Rs 12,499. It's a Micro-SIM handset sporting a 5.0 inches screen with 720 x 1280 pixels resolution Handset weight 146 g with Li-Ion 2600 mAh battery. Samsung Galaxy J5 is using the chipset Qualcomm MSM8916 Snapdragon 410. It is running with HSPA 21.1/5.76 Mbps speed. There is 13 MP, 4128 x 3096 pixels, autofocus, LED flash front camera and 5 MP, LED flash rear camera . Its memory configuration is as : Internal memory-8/16 GB, 1.5 GB RAM. It has ,and comes up with a dimension of 142.1 x 71.8 x 7.9 mm. When we talk about features. It supports microSD, up to 128 GB. GPU : Adreno 306. Display Type : Super AMOLED capacitive touchscreen, 16M colors. Video: 1080p@30fps. Other feature:Geo-tagging, touch focus, face detection. 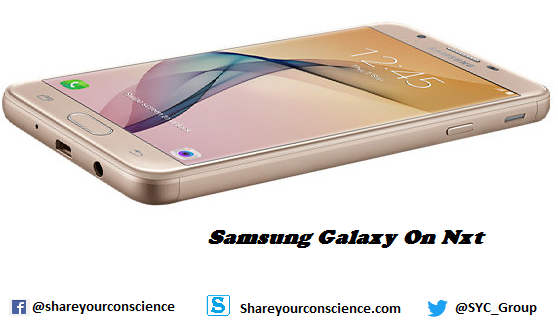 Samsung Galaxy J2 8GB from Samsung is a Quad-core 1.3 GHz Cortex-A7 powered smartphone running over a 4.7 inches screen. This handset was launched in India on 2015, September. 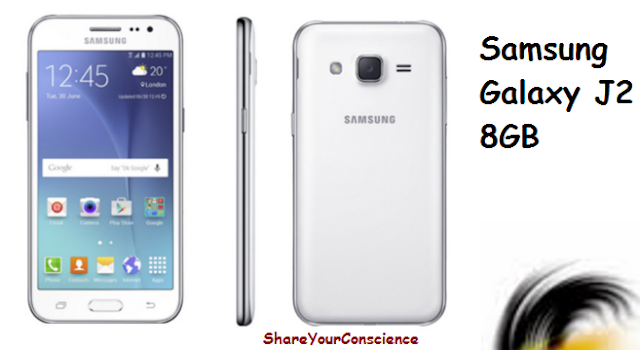 Samsung Galaxy J2 8GB will be available in India for Rs 8,496. It's a Optional Dual SIM handset sporting a 4.7 inches screen with 540 x 960 pixels resolution Handset weight - with Li-Ion 2000 mAh battery. Samsung Galaxy J2 8GB is using the chipset Exynos 3475. It is running with HSPA 42.2/5.76 Mbps, LTE Cat4 150/50 Mbps speed. There is 5 MP, 2592 x 1944 pixels, autofocus, LED flash front camera and 2 MP rear camera . Its memory configuration is as : internal memory-8 GB, 1 GB RAM. It has ,and comes up with a dimension of 136.5 x 69 x 8.4 mm . When we talk about features. It supports microSD, up to 128 GB. GPU: Mali-T720. Display Type: Super AMOLED capacitive touchscreen, 16M colors. Video: 720p@30fps. Other feature:Geo-tagging, touch focus, face detection.